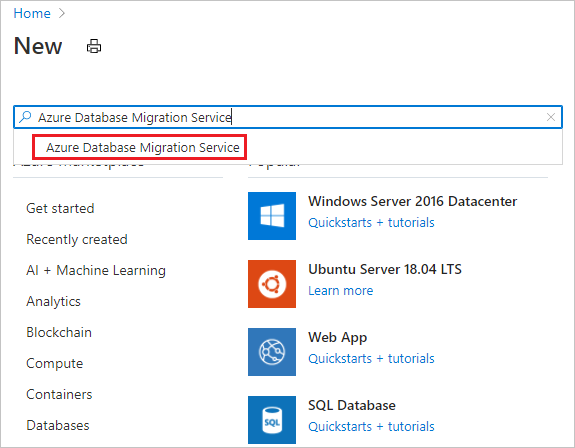 You can use the Azure Database Migration Service to migrate the databases from an on-premises SQL Server instance to Azure SQL Database. 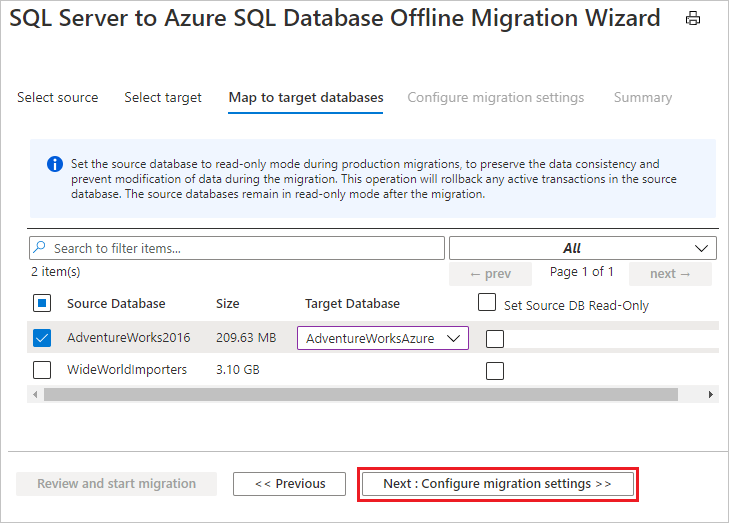 In this tutorial, you migrate the Adventureworks2012 database restored to an on-premises instance of SQL Server 2016 (or later) to a single database or pooled database in Azure SQL Database by using the Azure Database Migration Service. Assess your on-premises database by using the Data Migration Assistant. Migrate the sample schema by using the Data Migration Assistant. 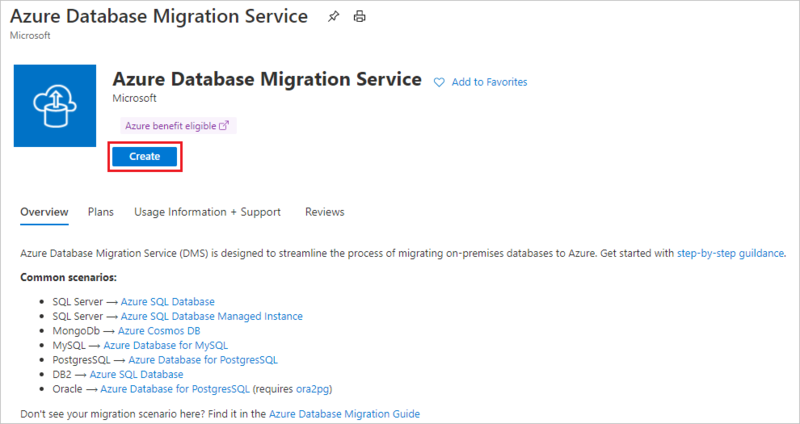 Create an instance of the Azure Database Migration Service. 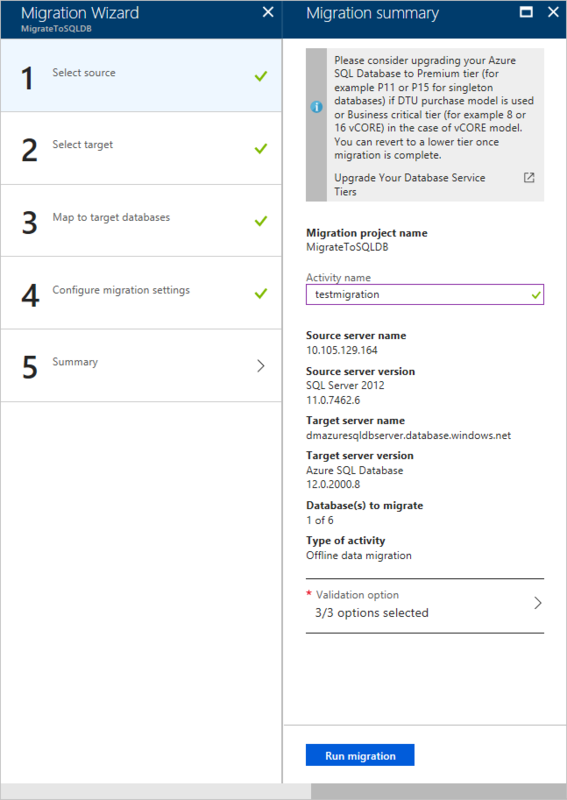 Create a migration project by using the Azure Database Migration Service. When you migrate databases to Azure by using Azure Database Migration Service, you can do an offline or an online migration. With an offline migration, application downtime starts when the migration starts. With an online migration, downtime is limited to the time to cut over at the end of migration. We suggest that you test an offline migration to determine whether the downtime is acceptable; if not, do an online migration. This article describes an offline migration from SQL Server to a single database or pooled database in Azure SQL Database. 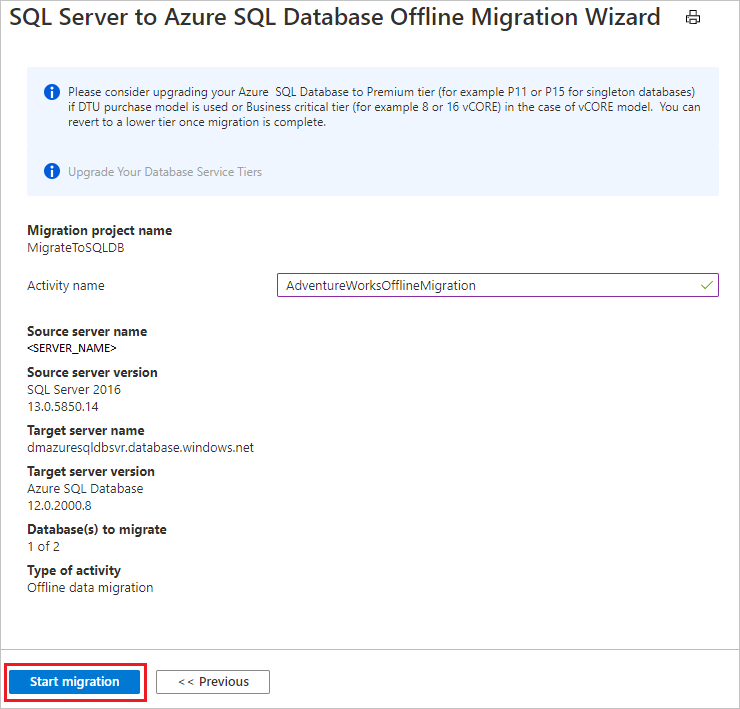 For an online migration, see Migrate SQL Server to Azure SQL Database online using DMS. Download and install SQL Server 2016 or later (any edition). Enable the TCP/IP protocol, which is disabled by default during SQL Server Express installation, by following the instructions in the article Enable or Disable a Server Network Protocol. Create a single (or pooled) database in Azure SQL Database, which you do by following the detail in the article Create a single database in Azure SQL Database using the Azure portal. If you use SQL Server Integration Services (SSIS) and want to migrate the catalog database for your SSIS projects/packages (SSISDB) from SQL Server to Azure SQL Database, the destination SSISDB will be created and managed automatically on your behalf when you provision SSIS in Azure Data Factory (ADF). For more information about migrating SSIS packages, see the article Migrate SQL Server Integration Services packages to Azure. Create an Azure Virtual Network (VNET) for the Azure Database Migration Service by using the Azure Resource Manager deployment model, which provides site-to-site connectivity to your on-premises source servers by using either ExpressRoute or VPN. This configuration is necessary because the Azure Database Migration Service lacks internet connectivity. Ensure that your VNET Network Security Group rules don't block the following inbound communication ports to Azure Database Migration Service: 443, 53, 9354, 445, 12000. For more detail on Azure VNET NSG traffic filtering, see the article Filter network traffic with network security groups. Configure your Windows Firewall for database engine access. Open your Windows firewall to allow the Azure Database Migration Service to access the source SQL Server, which by default is TCP port 1433. If you're running multiple named SQL Server instances using dynamic ports, you may wish to enable the SQL Browser Service and allow access to UDP port 1434 through your firewalls so that the Azure Database Migration Service can connect to a named instance on your source server. When using a firewall appliance in front of your source database(s), you may need to add firewall rules to allow the Azure Database Migration Service to access the source database(s) for migration. Create a server-level IP firewall rule for the Azure SQL Database server to allow the Azure Database Migration Service access to the target databases. Provide the subnet range of the VNET used for the Azure Database Migration Service. Ensure that the credentials used to connect to source SQL Server instance have CONTROL SERVER permissions. 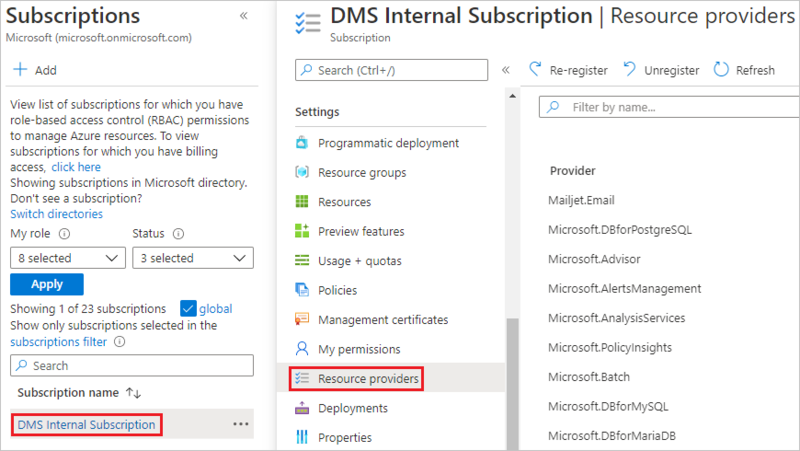 Ensure that the credentials used to connect to target Azure SQL Database instance have CONTROL DATABASE permission on the target Azure SQL databases. Both report types are selected by default. If you use SSIS, DMA does not currently support the assessment of the source SSISDB. However, SSIS projects/packages will be assessed/validated as they are redeployed to the destination SSISDB hosted by Azure SQL Database. For more information about migrating SSIS packages, see the article Migrate SQL Server Integration Services packages to Azure. For single databases or pooled databases in Azure SQL Database, the assessments identify feature parity issues and migration blocking issues for deploying to a single database or pooled database. The SQL Server feature parity category provides a comprehensive set of recommendations, alternative approaches available in Azure, and mitigating steps to help you plan the effort into your migration projects. The Compatibility issues category identifies partially supported or unsupported features that reflect compatibility issues that might block migrating on-premises SQL Server database(s) to Azure SQL Database. Recommendations are also provided to help you address those issues. Review the assessment results for migration blocking issues and feature parity issues by selecting the specific options. 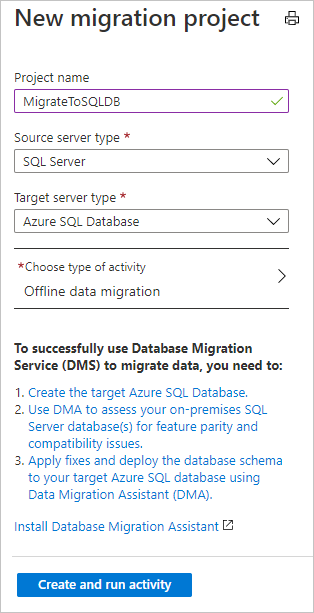 After you're comfortable with the assessment and satisfied that the selected database is a viable candidate for migration to a single database or pooled database in Azure SQL Database, use DMA to migrate the schema to Azure SQL Database. 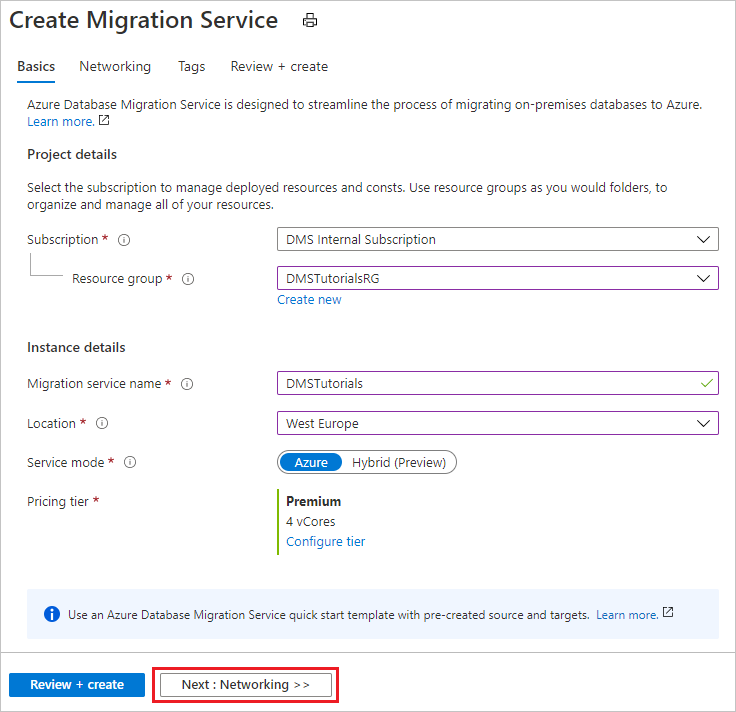 Before you create a migration project in Data Migration Assistant, be sure that you have already provisioned an Azure SQL database as mentioned in the prerequisites. For purposes of this tutorial, the name of the Azure SQL Database is assumed to be AdventureWorksAzure, but you can provide whatever name you wish. If you use SSIS, DMA does not currently support the migration of source SSISDB, but you can redeploy your SSIS projects/packages to the destination SSISDB hosted by Azure SQL Database. For more information about migrating SSIS packages, see the article Migrate SQL Server Integration Services packages to Azure. In the Data Migration Assistant, select the New (+) icon, and then under Project type, select Migration. Specify a project name, in the Source server type text box, select SQL Server, and then in the Target server type text box, select Azure SQL Database. Under Migration Scope, select Schema only. Select Create to create the project. In the Data Migration Assistant, specify the source connection details for your SQL Server, select Connect, and then select the AdventureWorks2012 database. Select Next, under Connect to target server, specify the target connection details for the Azure SQL database, select Connect, and then select the AdventureWorksAzure database you had pre-provisioned in Azure SQL database. Select Next to advance to the Select objects screen, on which you can specify the schema objects in the AdventureWorks2012 database that need to be deployed to Azure SQL Database. By default, all objects are selected. Select Generate SQL script to create the SQL scripts, and then review the scripts for any errors. Select Deploy schema to deploy the schema to Azure SQL Database, and then after the schema is deployed, check the target server for any anomalies. Sign in to the Azure portal, select All services, and then select Subscriptions. 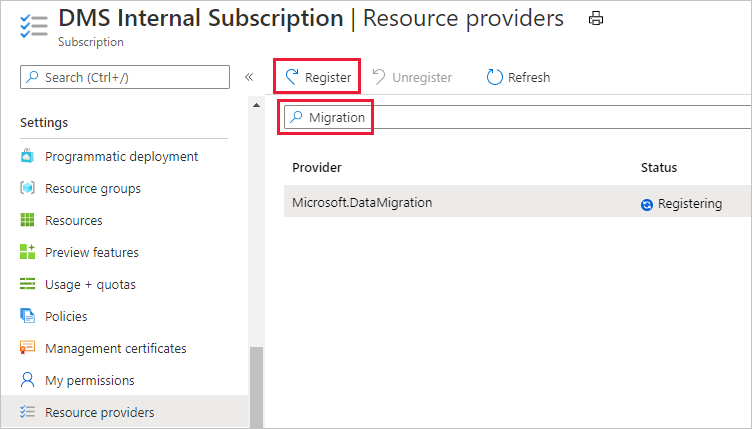 Select the subscription in which you want to create the instance of the Azure Database Migration Service, and then select Resource providers. Search for migration, and then to the right of Microsoft.DataMigration, select Register. The VNET provides the Azure Database Migration Service with access to the source SQL Server and the target Azure SQL Database instance. For more information about how to create a VNET in the Azure portal, see the article Create a virtual network using the Azure portal. For more information on costs and pricing tiers, see the pricing page. If you need help with choosing the right Azure Database Migration Service tier, refer to the recommendations in the posting here. After the service is created, locate it within the Azure portal, open it, and then create a new migration project. On the New migration project screen, specify a name for the project, in the Source server type text box, select SQL Server, in the Target server type text box, select Azure SQL Database, and then for Choose type of activity, select Offline data migration. Select Create and run activity to create the project and run the migration activity. On the Migration source detail screen, specify the connection details for the source SQL Server instance. Make sure to use a Fully Qualified Domain Name (FQDN) for the source SQL Server instance name. You can also use the IP Address for situations in which DNS name resolution isn't possible. If you have not installed a trusted certificate on your source server, select the Trust server certificate check box. When a trusted certificate is not installed, SQL Server generates a self-signed certificate when the instance is started. This certificate is used to encrypt the credentials for client connections. SSL connections that are encrypted using a self-signed certificate do not provide strong security. They are susceptible to man-in-the-middle attacks. You should not rely on SSL using self-signed certificates in a production environment or on servers that are connected to the internet. If you use SSIS, DMS does not currently support the migration of source SSISDB, but you can redeploy your SSIS projects/packages to the destination SSISDB hosted by Azure SQL Database. For more information about migrating SSIS packages, see the article Migrate SQL Server Integration Services packages to Azure. 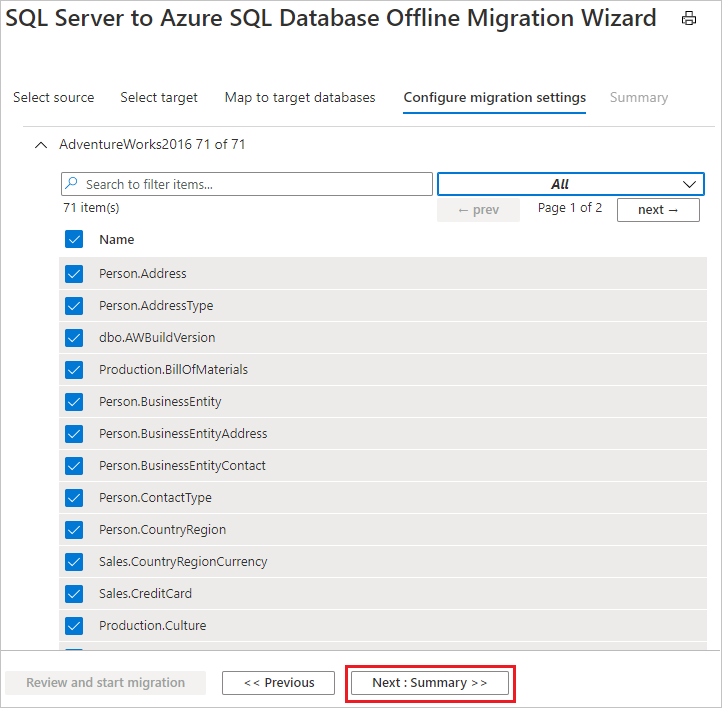 Select Save, and then on the Migration target details screen, specify the connection details for the target Azure SQL Database Server, which is the pre-provisioned Azure SQL Database to which the AdventureWorks2012 schema was deployed by using the Data Migration Assistant. 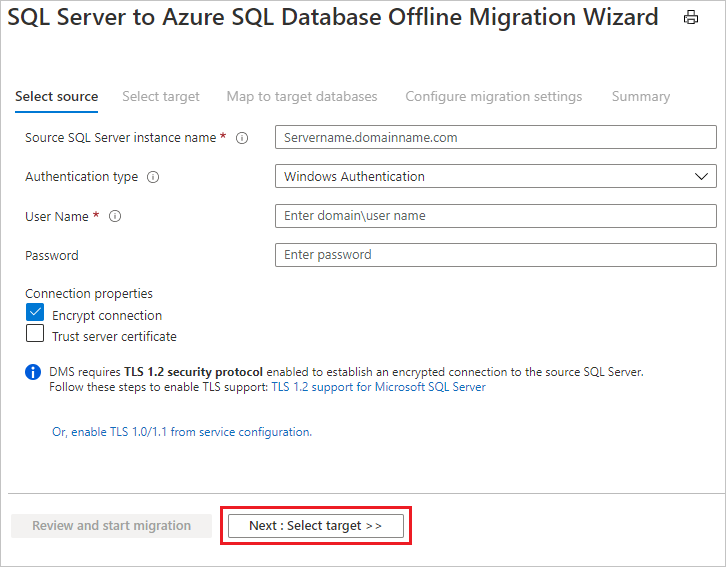 If the target database contains the same database name as the source database, the Azure Database Migration Service selects the target database by default. Note that the Azure Database Migration Service auto selects all the empty source tables that exist on the target Azure SQL Database instance. If you want to remigrate tables that already include data, you need to explicitly select the tables on this blade. The migration activity window appears, and the Status of the activity is Pending. On the migration activity screen, select Refresh to update the display until the Status of the migration shows as Completed. SQL migration using Azure Data Migration Service (DMS) hands-on lab. 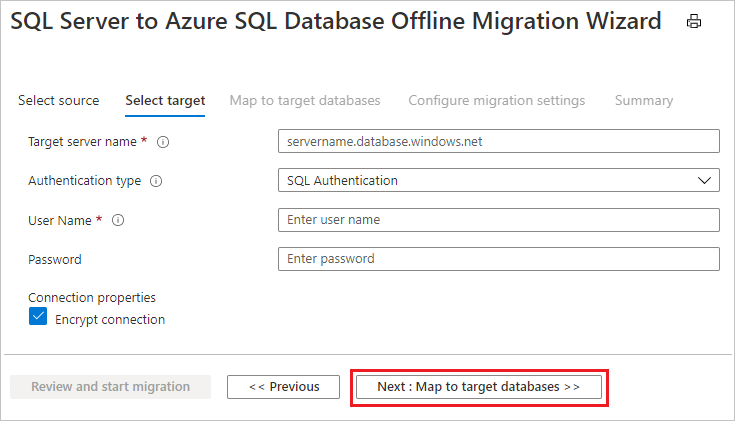 For information about known issues and limitations when performing online migrations to Azure SQL Database, see the article Known issues and workarounds with Azure SQL Database online migrations. For information about the Azure Database Migration Service, see the article What is the Azure Database Migration Service?. For information about Azure SQL Database, see the article What is the Azure SQL Database service?.